Most people know of the Ten Commandments. (1) When I was young they were posted in the schools, courts, etc. With the shift to a secular society this has changed somewhat. But life would certainly be better if everyone lived by these commandments. Thou shall have no other car except thy own kid-built car. Thou shall not exceed 5 ounces for thy car. Thou shall not swear, or grumble or even bite thy lip over any race result, whether thou be car owner, sibling or relative. 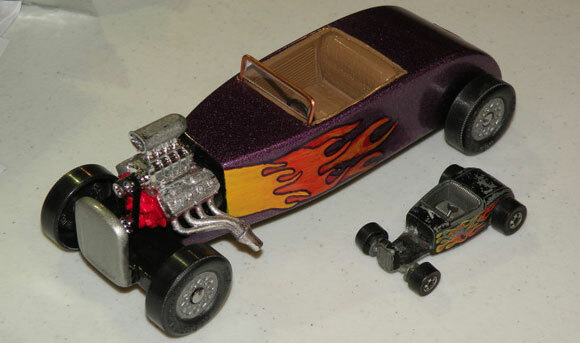 Remember, Pinewood Derby is for the kids; thou shall keep it for the kids always. Honor thy race committee and judges, lest thou be thanked for volunteering to be the next pinewood derby committee chair. 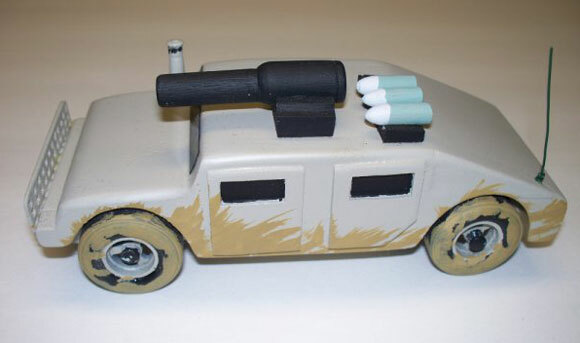 Thou shall not kill a child’s happiness on pinewood derby day by being a bad sport. Thou shall not commit acts that undermine the bonds of parent and child. Thou shall not steal the enthusiasm of any child on race day. Thou shall not bear false witness as to any race result. Thou shall not covet thy neighbor’s car, nor thy neighbor’s graphite, nor thy neighbor’s decals, nor thy neighbor’s good fortune. I applaud these commandments, as following them certainly would help keep fun and excitement in pinewood derby racing. But since I can’t leave well-enough alone, I would like to offer my version of the Ten Commandments for pinewood derby racing. These don’t necessarily parallel the Ten Commandments, but are certainly important rules to follow to have a fun and low-stress event (and a fast car too!). You shall understand the rules before building the car — Don’t get disqualified, or have to do a last minute part change. You shall design the car, including the weighting method, before cutting out the car — Adding weight after the car is cut out is difficult, and oftentimes a car-damaging undertaking. Remember that a good looking car and a fast car can be one and the same, but often are not — Reserve enough time to work on the wheels and axles. They are responsible for at least 80 percent of the speed of the car. Honor the spirit of the event by letting the child do as much work as they physically and safely can — It’s their car after all! You shall respect your tools’ cutting edges — Keep them sharp, and away from your fingers! You shall test and adjust the alignment of the car before race day — A well-aligned car has a big advantage over a poorly aligned car. Don’t break this commandment! You shall handle the car carefully — Don’t play with it before the race, and store/transport it in a padded container. You shall be a good sport — Don’t brag about your car either before or after the race, and offer your compliments to the other car owners. Whatever your stance on the Bible, or on posting the Ten Commandments, I believe we can all agree that our society would be a better place if everyone lived by these rules. And I guarantee that your pinewood derby experience will be greatly improved if you abide by either version of the Ten Commandments of Pinewood Derby Racing! (1)In summary, the Ten commandments are listed below (NASB version). They can be found in the Bible in Exodus 20:1-17. (2)Author unknown. Edits were made to make the commandments generic. Joey, age 9, has always been a car guy since he was very small. He has an extensive hot wheels collection including some of the cars I saved from when I was his age. He’s been drawing cars for years. This year he told me he wanted to “go for looks”, although he still wanted the car to be fast. He drew a very detailed hot rod and my old hot wheels car came immediately to my mind. I asked him if he could find it and he brought it right out. We measured the car with a 6 inch ruler and scaled it up at first, but the wheel base was about an inch shorter than the maximum allowed so we stretched it a bit. Joey is very detail oriented so we went to the hobby shop and looked at model cars to find an engine. He was very picky, but we finally found one he liked. As far as Joey is concerned, the bigger the “blower”, the better! The dash, door panels, and window glass were also “stolen” from the model and modified with the belt sander to fit. The windshield frame is a piece of 12ga electric wire, and the seat was cut out of a piece of scrap. Joey cut the car on a band saw and scroll saw, and I routed the engine bay and weight pocket. We admittedly shared the sanding, as Joey doesn’t like to sand much. Joey picked the paint, and said he wanted flames. We thought we would just print up some flames on transparent stickers, but they wouldn’t show up so we painted them with mom’s acrylic paints. We also put on a few coats of acrylic clear spray. Joey prepared his axles by removing the mold marks, and I sanded them. The wheels this year were a matched set of official BSA wheels with no machining. We squared up and polished the bores with micro-gloss and that’s it! Joey didn’t place in the top 3, but he really loves his car, and he had a good time and a great attitude. In the process he continued to learn how to use power tools, solve problems, and the best part, I got to spend time with him. 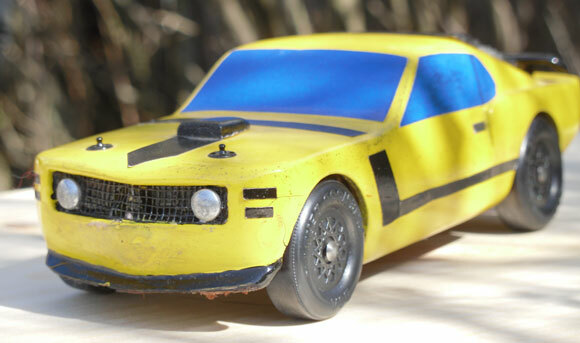 This 1970 Mustang Mach 1 was the last car built by my youngest son and I for his last race as a Cub scout. The car came in second place for the Webelos in the district. The entire car is made with only pieces we found around the house. I built this Humvee for the adult division in our church Awana Grand Prix. Its performance was somewhat mediocre, but the fun for me is building them. It weighed 5.0 ounces on the dot. With the exception of the thin wire I used for the antenna, everything else was cut and carved from pine. The Pro-Body tool is a great and invaluable tool, but the tool locates the axle holes very close to the bottom of the block. I am concerned that with so little wood below the axle, there is the potential for wood breaking out of the entrance hole distorting under impact. Also if the edge of the wood is sanded the radius approaches the edge of the hole. I would prefer the axles to be located at 1/8 inch on center. The Pro-Body Tool is designed to put pilot holes in the slots on a standard BSA kit, or to drill axle holes. So the holes are positioned such that the top of the hole is 1/8 inch to match the slot height. So far, I have never heard of a case where the wood broke or distorted because of the hole position. The Pro-Body Jig locates holes centered at 1/8 inch, so it would set the height at your desired location. This is also the location of the axle holes on our pre-cut kits and blocks. Because of this added height, the Pro-Body Jig cannot be used to put pilot holes in axle slots. So, you may prefer the Pro-Body Jig over the Pro-Body Tool. From your experience, does the amount of clearance between the bottom of the car and the track impact the speed? In other words, we typically mount our axles, to allow for 3/8 inch between the bottom of the car and the bottom of the wheel. We were trying to determine if lowering or raising the attitude of the car would make an improvement. In general, the lower the center of gravity, the greater the stability and potential energy of the car. However, most races require a 3/8 inch ground clearance. So be aware, if you go lower than that your car could be disqualified. There is also a risk of dragging during the curved transition if the clearance is very low. This is more of an issue on tracks with a sharper transition, such as the original version of the BestTrack.